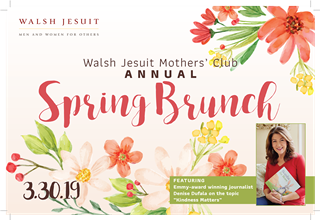 The Walsh Jesuit High School Mothers' Club, a service organization, under the patronage of the Immaculate Heart of Mary, is committed to fostering close bonds between students, parents and the school through the social, intellectual and spiritual interaction of its members. Established more than 40 years ago, the Walsh Jesuit Mothers' Club is an association of mothers and guardians of WJ students. It is committed to serving the mission of the school through service to the Walsh Jesuit community. The Mothers' Club works to fulfill its mission by hosting a variety of its own and school-sponsored events, and by offering programs throughout the school year. Its aim is to provide a source of information and an opportunity to foster development of fellowship and friendship. It seeks to achieve its goals by creating environments that stimulate and contribute to reflective, spiritual, social, interactive, and inclusive atmospheres. We hope you can join us in volunteering service to our school through Mothers' Club committees. Our presentation will feature a panel discussion with several WJ moms. Each will share her journey and story of the path she’s chosen for herself as kids have graduated or grown older. Whether it’s discovering new talents, rekindling a passion or putting themselves back in the workforce each woman has carved out a new chapter in her life. It promises to be enlightening and empowering for every mother. Whether you want to get involved, meet other parents or just know more about what is going on at school Mothers’ Club is the way to do it! Please RSVP for the meeting to Melissa Ost at wjmcvp@gmail.com by March 29, 2019. For questions call Jill Ziegler at 216-308-3901.